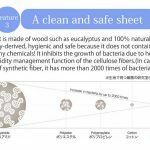 Since its production in 1988, TENCEL© uses the fiber which is made by plant extract through complete circulatory system, and it is reassuring and safe with less environmental load. Due to its soft texture, it is the most appropriate fiber to make a mask. Feature 2: It has the mild sense of touch as if it will melt. 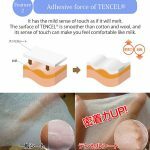 The surface of Tencel© is smoother than cotton and wool, and its sense of touch can make you feel comfortable like milk. 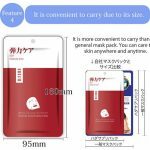 Feature 4: It is more convenient to carry than the generak mask pack. You can care the skin anywhere and anytime. Feature 5: Paraben free. 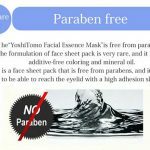 The “YoshiTomo Facial Essence Mask” is free from parabens. 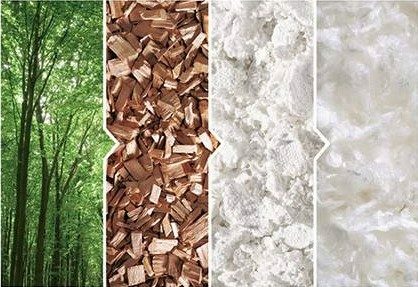 The formulation of face sheet pack is very rare, and it is also additive-free coloring and mineral oil. 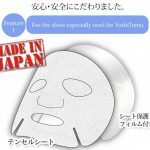 It is a face sheet pack that is free from parabens, and it is cut to be able to reach the eyelid with a high adhesion sheet. Safe because it does not contain any chemicals!